Understanding and mapping your idea to a lifecycle stage to focus on solving the right problems at the right time, with supporting tools and practices to utilise. How Business Model generation should be the focus over productisation in early stages. A product alone is not enough. How companies should consider a Venture Capital approach to funding over budgeting to improve innovation potential; opening up your innovation funnel. When and how to use the engine of IDEA-EXPLORE-VALIDATE stages to expand to new markets and geographies. By way of example, diving into the Explore phase and sharing how you can learn about potential opportunity without building anything through customer development practices. How the craft of UX researched and the discovery of Jobs-To-Be-Done is key to business model value. How process conformity can be a dangerous distraction to your business. Outcome delivery is more critical for business value. If you run a professional network or group and would like me to present on the above or other related topics covered by The Lean Product Lifecycle, then pleased get in touch. There are many levels to consider beyond the book which can help improve innovation and transformation strategies at a product or portfolio level. 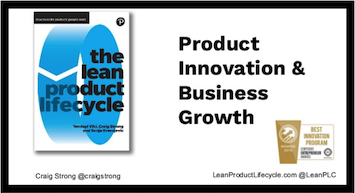 If you would like to be kept up to date with news and updates, please subscript to LeanProductLifecycle.com or join the LinkedIn group here.